Harry Alexander and Benjamin Warbis in the Satie Studs, Ogive 4, section of to a simple, rock ‘n’ roll… song. to a simple, rock ‘n’ roll… song: Satie Studs / Ogives Composite, Land and my mother, my dog and CLOWNS! Whenever I see Michael Clark’s company I usually come away energised and uplifted. Nobody fuses ballet to a youthful modern world like Clark does or reminds you that it’s a tough technique that’s been around a long time. This programme really underlines that, driven as it was from the starkness of Satie piano works, through Patti Smith’s now 40-year-old take on Punk and finishing with a medley of David Bowie songs including one of the last works Bowie released before he died earlier this year. Kieran Page and Melissa Hetherington in the Satie Studs, Ogive 2, section of to a simple, rock ‘n’ roll… song. The programme opens with Satie Studs (or Satie Studs / Ogives Composite to give the full title), to link in with the 150th anniversary of Satie’s birth. It couldn’t be more austere, rammed home in its black and white all-in-ones, if made to pop by often strong colours on the ever-changing backcloth. It starts with the dancers all balancing on one leg and there is the more-or-less inevitable wobble. This is tough and rigorous and he expects a lot of his company including the wonderful Oxana Panchenko, Melissa Hetherington and the tall Harry Alexander. The work is magisterial and gorgeously dry, with formal lines and entrances made but it’s also Clark so there are odd inversions, and surreal partnering that makes you chuckle. A solo can start as classical ballet, end with the dancer as a folded inverted statue who then gets unceremoniously picked up by 2 others, as is, and carted off stage. But overall this is about Clark’s deep appreciation of ballet and Satie and it really ought to have a bigger life beyond his company. Oxana Panchenko in LAND, the Act II section of to a simple, rock ‘n’ roll… song. The bill opens out in the Patti Smith, Land, section and punkily is dressed in shiny latex flares (very 70’s) with a wild back-screen projection full of moving numbers. By Charles Atlas, it’s actually so good it competes head on with the dance and you have to consciously tune it out to see what the dancers are up to. The clarity of the Satie is leaving us and the wild side of Clark’s ballet is rising and with it the invention, and your eyes constantly find themselves wrong-footed as limbs fly, or are carefully placed, where you don’t expect. Harry Alexander and Jordan James Bridge in LAND, the Act II section of to a simple, rock ‘n’ roll… song. After the interval comes the Bowie section, called my mother, my dog and CLOWNS!, and as the beat becomes more thunderous, the costumes become colourful, bright bronze, all-in-ones and the sense of ballet anarchy dials up another notch – hips might even have wiggled! Clark makes his usual appearance – at first darting on and off stage for a second or so but then coming on properly, ceremonially lying flat as if a corpse, before becoming a Diaghilev character and driving the dance on. Kate Coyne, one of his former dancers and now assistant director, also makes a cameo appearance to much appreciation. The place is full of fans who wouldn’t dream of missing Clark’s more or less annual shows, and although this isn’t the first night of the Barbican run, it was packed and many stood to clap at the end. And besides feeling elated as ever, particularly by his beautiful dancers, you ask yourself why leading ballet companies don’t entice Clark to create work for them? Although Clark might now be in his mid-fifties, he feels forever a rebellious and disruptive 18 year old – so see the kid this week at the Barbican while you can. 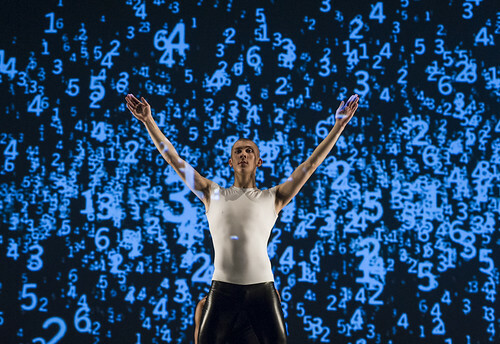 It so happens that David Bintley’s Birmingham Royal Ballet is also performing in London this week (at Sadler’s Wells) – Bintley’s only 4½ years older but it feels more like they are a century apart artistically.